The 11th Annual Lake Links Workshop, Climate Change – How to Build Resiliency in our Lakes, was held at the Perth Civitan Hall on Saturday, October 20th, 2012. 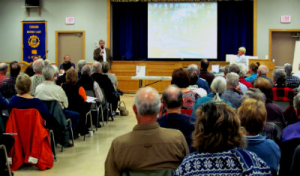 Over 100 attendees, including landowners, environmental group representatives, municipal staff members, and lake association members, partook in focused discussions and Q&A sessions on the topic of climate change. Five overarching themes were addressed during the workshop: social, environmental, recreational, economical, and what landowners can do to adapt to climate change. View the Information Package for this event. Informative presentations highlighted real examples of climate change effects, and resiliency and adaptation strategies. To find out more about what you can do about Climate Change, download A Practitioner’s Guide to Climate Change Adaption in Ontario’s Ecosystems. This guide introduces the concepts of climate change adaptation, vulnerability, and risk. It also describes vulnerability and risk assessment tools and techniques, and a framework that can be used to support adaptive management in a rapidly changing climate. The Lake Links 2012 planning committee is grateful to the Federation of Ontario Cottagers’ Associations and French Planning Inc. for their continued generous support of this event. Thank you to all of the attendees for their donations of over six boxes of food that went to the Perth Food Bank, the Table. Organization of this event has been shared with a number of regional partner groups over the past years including the Bobs and Crow Lakes Association, Centre for Sustainable Watersheds, Cataraqui, Mississippi and Rideau Valley Conservation Authorities, Community Stewardship Council of Lanark County, Christie Lake Association, Friends of the Salmon River, Friends of the Tay Watershed, Frontenac County Stewardship Council, Fourteen Island and Mink Lake Association, Lake Networking Group, Leeds-Grenville County Stewardship Council, Ontario Ministry of Natural Resources (Kemptville District), Otter Lake Association, Otty Lake Association and Parks Canada.